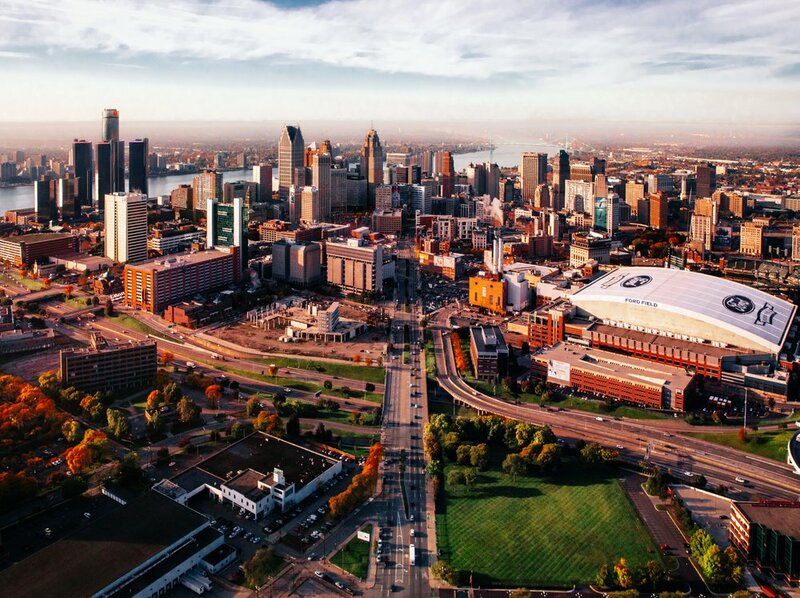 Detroit has changed a lot over the last ten years and one local photographer has been capturing all things hip in Detroit throughout those years. That photographer's name is Camera Jesus, if you aren't familiar with his work, it's time to get in the loop and see what one of Detroit's most talented creative minds has to offer. His Instagram is full of one of a kind shots of the mitten and his stories take you to places that you're unlikely to visit on your own. He has climbed some of the city's biggest buildings and captured some of our most historical moments, and through it all, he has shared his journey with all of us. Unfortunately, during one of his last adventures his car was broken into and all of his equipment was stolen. So, despite his protests, we decided that there was no better reason to rally together to help a fellow creative get back on his feet. Joe Gall's (a.k.a. Camera Jesus') adventures have brought us so much happiness throughout these years and we owe everything to him. He has taken so many candid photos for us over the years and given us a unique perspective on this city that we wouldn't otherwise be able to get. We don't want to wait too long to see him out and about exploring and working again, so we have organized a Go Fund Me to get the troops to rally around Joe and get him back out there doing what he does best. So, if you would like to help Camera Jesus like we do there are two ways that you can do that. The first way is to visit this Go Fund Me and make a donation. 100% of the proceeds will go to Joe. The second way to help is to purchase one of Camera Jesus' prints for yourself by clicking here. His work is absolutely amazing and his shop is full of amazing prints that everyone would love to have on their walls. So please take a second and make a donation or buy something new today so that the king of capturing Detroit can get back to what he does best! Photo Credit: Joe Gall a.k.a. Camera Jesus - Click here to buy this print! Spring is finally here and that means so is baseball! 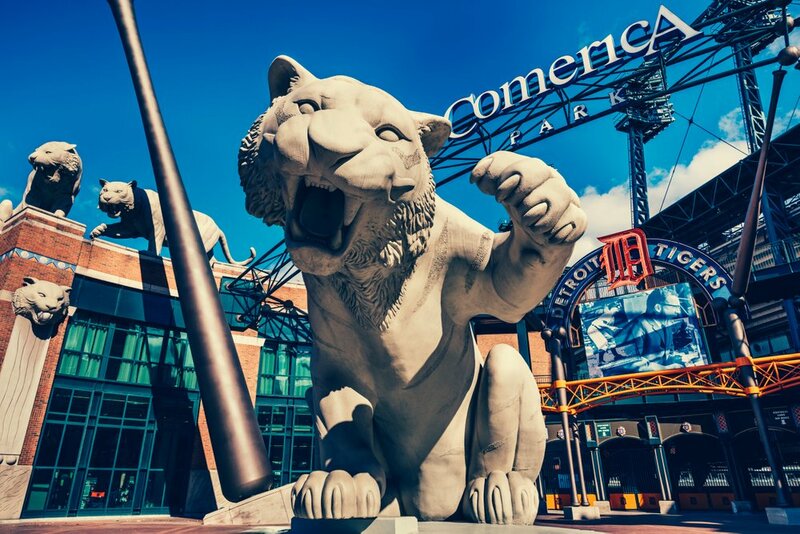 This Thursday afternoon the Detroit Tigers will kick off their season at Comerica Park against the Pittsburgh Pirates. Along with opening day comes awesome parties all around town. Since there are parties happening pretty much everywhere you look, we decided to narrow the list down a bit. Here are our picks for Opening Day 2018! POP + Offworld - The best barcade in town is opening its doors early at 9:30 AM! 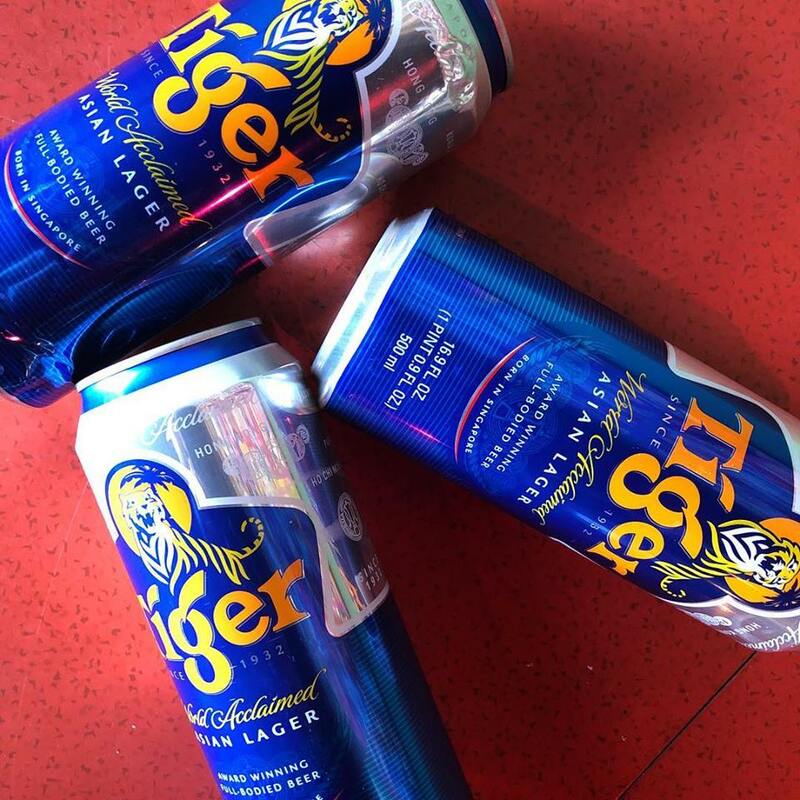 Grab a $6 Oberon, $2 Strohs or $4 Well Drink and play a few rounds of Mortal Kombat before you head over to the game! 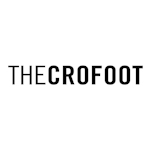 In addition to their already delicious selection of pizzas, they will also be featuring a Coney Dog Personal Pizza with a Lafayette Coney chili base, cheddar cheese blend, cheese curds, Dearborn beef sliced hot dogs, yellow mustard drizzle and of course white onions. 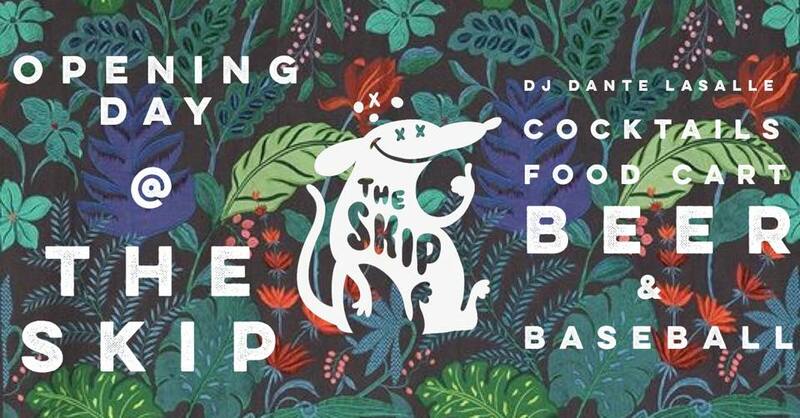 The Skip - The weather might be a little wet tomorrow afternoon so head to The Skip where you can party half inside and half outside. Located in one of the coolest alleys in Detroit, The Skip can open its bar up wide if the weather permits. In addition to their awesome craft cocktails, they'll be grilling brats and cracking beers throughout the day. Doors open at 10 AM. 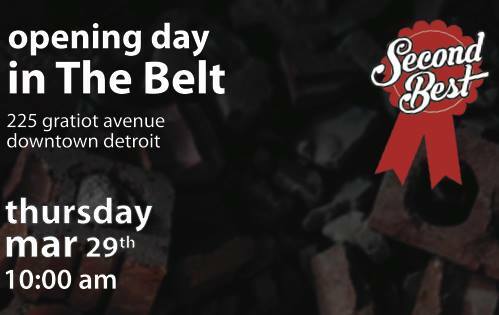 The Belt - Just outside of The Skip, a new bar and restaurant, Second Best, will be hosting a pop up! This is a great chance to get a sneak peak of this new spot before it opens in Midtown this summer. 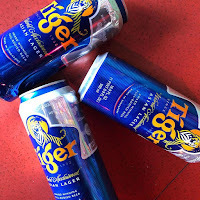 They will be serving up some of their awesome craft cocktails as well as a Red Bull bomb. Drinks start pouring at 10 AM. Grand Trunk Pub - Grand Trunk will be serving up breakfast sandwiches and will open its doors at 8 AM. They will also be hosting giveaways and will have Corridor Bratwurst specials throughout the day. New Holland Brewery will be in house too, with their artisan spirits and cocktails available all day. Stache International - The Stache wants you to taste their sausage! They're debuting their new sausages on Opening Day, plus they'll have $3.25 tall boys and shot specials all day. Parking is free and it's just a short walk away from the ballpark. If the walk is too far, the game will be shown on the screens in the bar too! 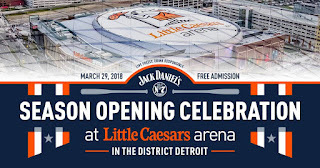 Detroit Home Opener Festival - One of the biggest Opening Day parties every year, this event takes over the park at Madison Ave. The event includes bands and DJs, heated tents, food, games, and more! Just look for all of the craziness going on at the Corner of Madison & Brush Next to The Music Hall starting at 9! Opening Day at LCA - If you don't have tickets to the game, this is the next best thing! 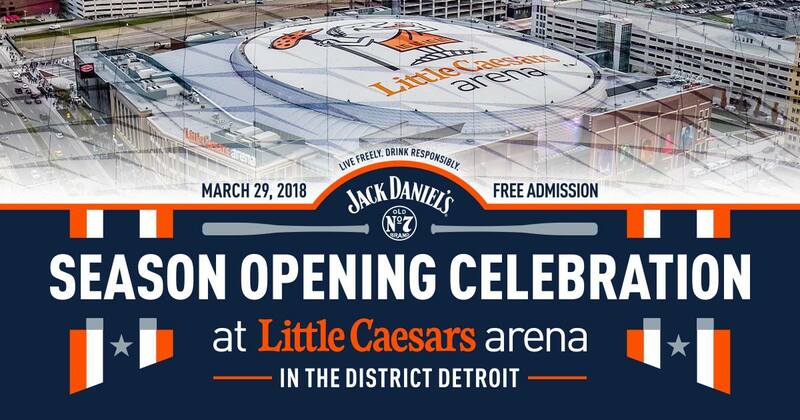 Little Caesars Arena is hosting a huge party just outside of the arena in the Chevrolet Plaza, with the game on their 900 ft. screen. The fun is happening both outside in the plaza and in the arena on the concourse, with over a dozen breweries on site, food, vendors, and live music! Plus, admission is free! The fun starts at 8 AM. 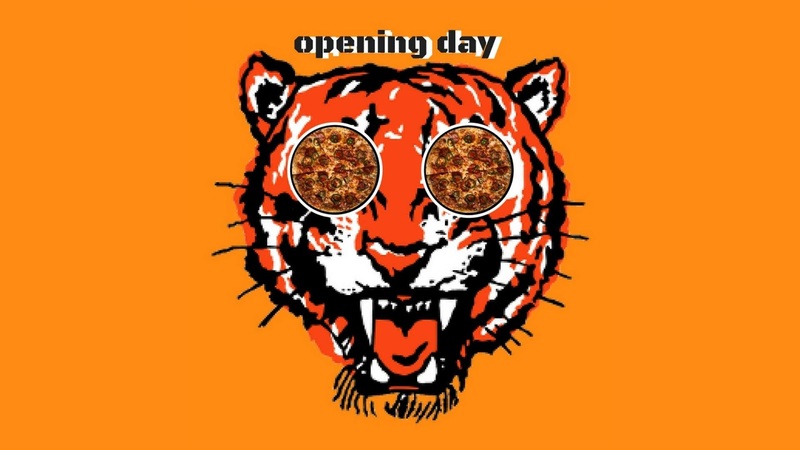 The first pitch for the Tigers season opener is at 1:10 PM this Thursday. Tickets to the game are still available. You can purchase yours here. Play ball! This Friday night The Octopus is celebrating the release of their highly anticipated new album. Supernatural Alliance is the debut album from the band, fronted by Masha Marjieh with J Frezzato, Matt O’Brien, Chuck Burns and Adam Cox. 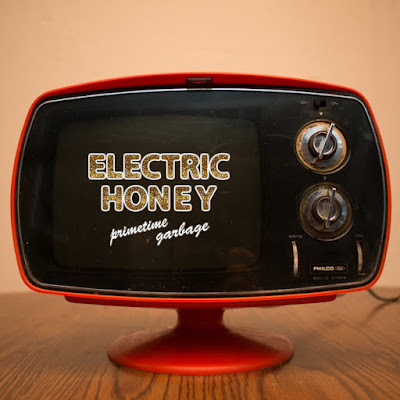 Their sound is best described as psychedelic hard rock, which you can hear for yourself in the title track off the new album below. Supernatural Alliance is being released by Rise Above Records and is available for purchase online here. It will be available in clear, purple and black vinyl, or on CD for those fans that want to rock out to this album in their car. In honor of this big release, The Octopus will be performing live at Small's this Friday, April 30th along with Timmy's Organism. There will also be Tarot Card Readings by Gemineye Tarot and DJs Lemmy Caution and Sean O'Neal will be playing tunes throughout the night. Tickets to see this awesome lineup live are only $5 and can be purchased in advance here. You can also pick up physical tickets at Small's and UHF. The night of the show, cover will go up to $10. Doors are set to open at 9 PM and 21+ are welcome. For more info on this show, click here. To keep up with The Octopus and see what they are up to next, make sure you give them a "like" on Facebook here. Jett Plastic Recordings has been putting out some awesome records over the past few years, from both local and national acts. 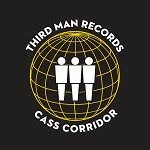 Their releases have included everyone from Detroit's own The ILL Itches to Macaulay Culkin's band The Pizza Underground. We recently had the chance to catch up with Jett Plastic owner and founder Jarrett Koral on our podcast, where he talked about the label's past and upcoming releases. He told us that 2018 would be the biggest year yet for Jett Plastic, with a ton of releases expected. One of those big releases is Troy Gregory's first vinyl record Xaviera. The album will actually be a double album, which you can get a little preview of here. Troy Gregory has been a big part of the Detroit music scene for years now, with involvement in other projects like The Witches, Prong, and The Dirtbombs. 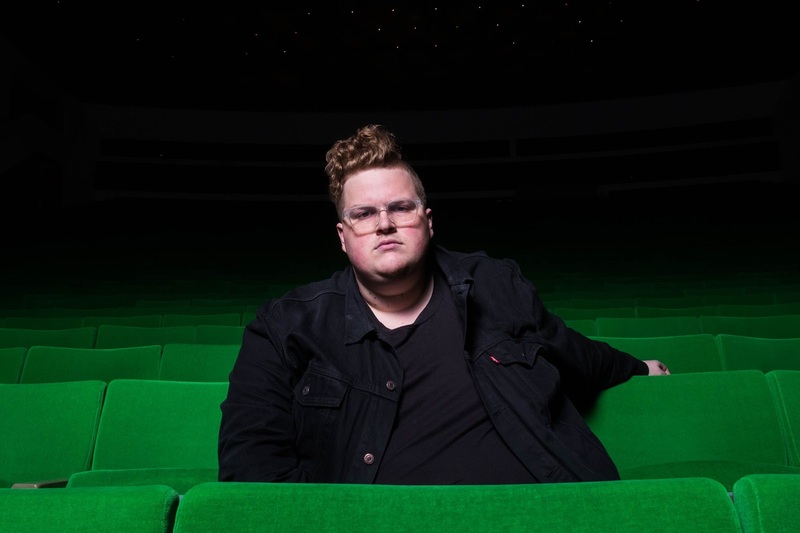 For his current solo project, Gregory performs with his band, Super Birthday, who will be performing with him this weekend at the release show. 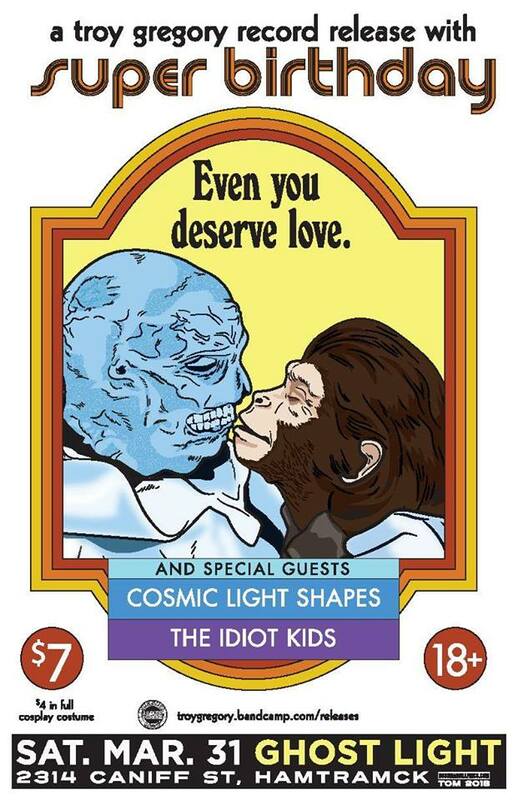 Also performing at the release show are The Idiot Kids and Cosmic Light Shapes. It's all happening this Saturday night at Ghost Light in Hamtramck. Cover for Saturday's release show is $7 or if you wear a full cosplay costume to the show, cover will only be $4. You also have a chance to get into the show for free if you email us at hipindetroit@gmail.com with #troy in the subject line. We will draw one lucky winner on Saturday morning and they will get in the door that night with a friend for free. Doors are set to open at 7 p.m. on Saturday and the music will start at 9. 18+ are welcome. 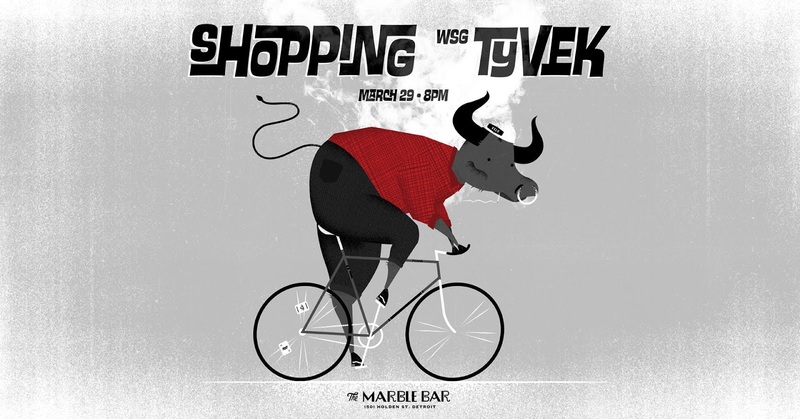 This Thursday night Shopping will be headed to town to play at Marble Bar. Reining from the UK, the trio just released a new album earlier this year. The Official Body is the third full length from the band. You can give it a listen below. 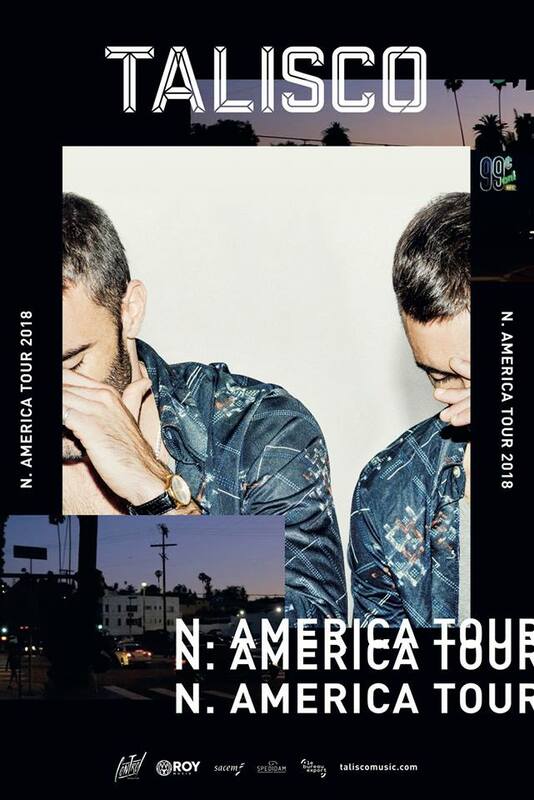 Shopping is currently making their way through the US and Canada and Detroit is one of the last shows on their tour. So let's make sure we show them a good time while they are here! You can pick up your ticket to see them play at Marble Bar for $10 here. You can also enter to win a pair of tickets to the show by emailing us at hipindetroit@gmail.com with #shopping in the subject line. We will draw one lucky winner on Thursday morning and they will get into the show that night with a friend for free. Tyvek will be joining Shopping on Thursday night and doors are set to open at 8 p.m. For more info, click here. Everyone knows that the Easter Bunny is coming to town this week, but NOBUNNY is also coming to town! NOBUNNY might not be as cute and cuddly as the Easter Bunny, but people still love NOBUNNY too. What started as a creepy bunny impersonating Elvis, has turned into an awesome band that has released a half dozen albums, as well as several singles and EPs. They even have a couple of music videos. 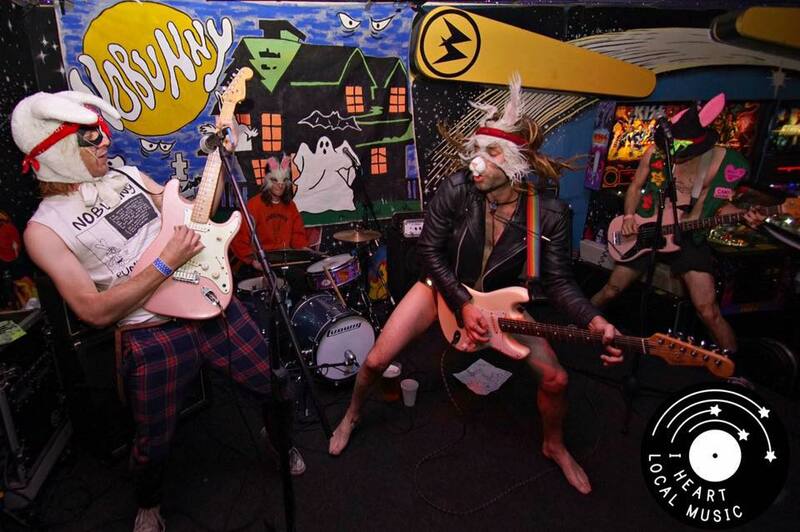 Check out NOBUNNY's video for "Blow Dumb" then read ahead to get details on their upcoming show. If you want to see this outrageously fun band live, head to Outer Limits in Hamtramck this Thursday night. They will be performing along with Village Wives and DJ Jam Jam Spiker. Tickets to the show are only $12 in advance or $14 the night of the show. To purchase your tickets in advance, click here. You can also enter to win a pair of tickets to this show courtesy of Party Store Productions. To enter to win, send your name to hipindetroit@gmail.com with #bunny in the subject line. We will draw one lucky winner the morning of the show and will send them details on how to claim their prize. For some of us Easter is a day to gather with family and share a meal, but for others it's a boring day when everyone is busy and lots of cool paces are closed. If you aren't into celebrating Easter in the traditional way, but you are looking for a place to have a great meal on the holiday, you can easily do that. Here's Hip's list of all the hot places to grab Easter Brunch this Sunday! Grim Feeder Vegan Brunch at El Club - This 100% vegan meal will feature 'Chicken' & Waffles, Classic French Toast & Fruit, 'Eggs" Benedict & Deviled Potatoes, Sticky Buns, and Spring Citrus Salad, as well as a Easter egg hunt where winners will find items like El Club show tickets and coupons for FREE pizza! This brunch is kid friendly, but they do not have high chairs. 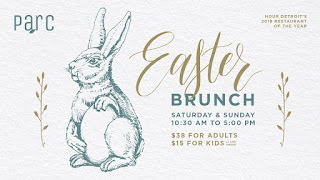 They start serving at noon and it ends at 3 p.m.
Easter Brunch at Union Street - Union Street will be serving up their regular menu as well as a special Easter only menu. They will be serving up brunch from 11 a.m. until 3 p.m. on Easter. 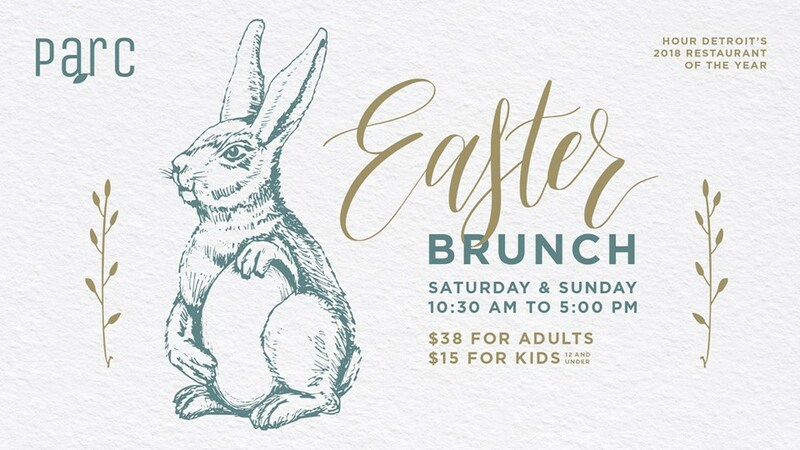 Easter Brunch at Parc - Parc is hosting back to back Easter Brunch meals on Saturday and Sunday from 10:30 a.m. until 5 p.m. This meal is $38 for adults and $15 dollars for children. 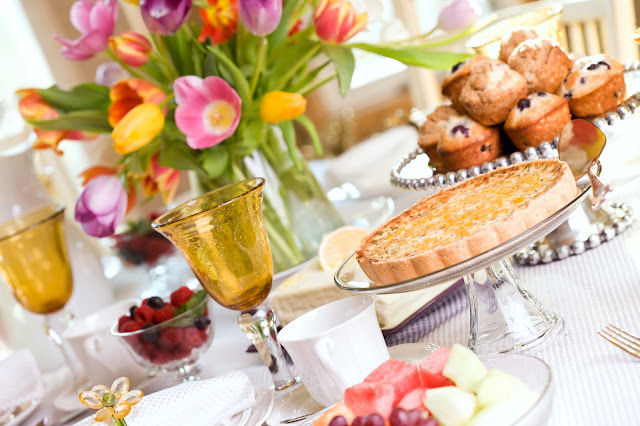 Easter Brunch Buffet at The Detroit Foundation Hotel - The Foundation Hotel brunch will feature multiple hot and cold stations and handmade pastries as well as a Bloody Mary and mimosa bar. Adults are $65 a person and children 12 and under are $30. Easter Brunch at Vertical Detroit - Vertical will be serving up selections like eggs benedict and quiche from 11 a.m. until 5 p.m. on Easter. 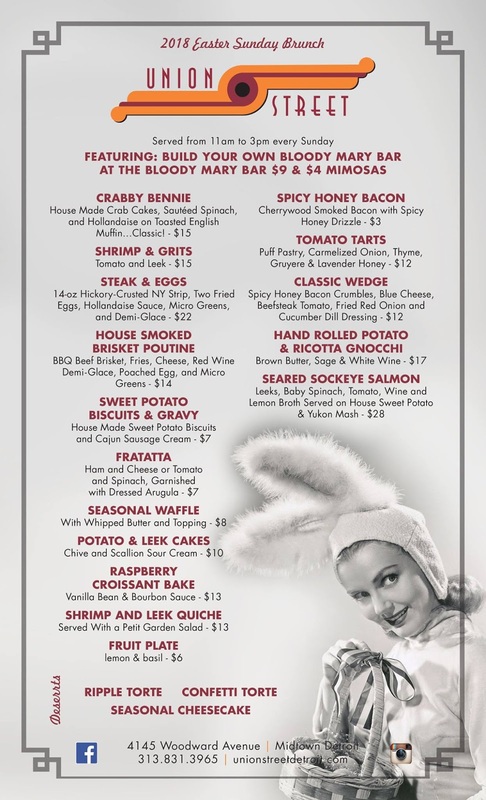 Easter Brunch at Hop Cat- Hop Cat will be celebrating Easter with a really cool collection of items including a White Russian inspired waffle, a macaroni and cheese sandwich and craft beer. Brunch will be served from 10 a.m. until 3 p.m. on Sunday. Raquel's Cocina pop up at Two James - Raquel's Cocina will be in house serving up Mexican dishes from 1 p.m. until 5 p.m. on Easter. Easter at Joe Muer's Seafood Detroit - Joe's will be serving up a Easter buffet from 10 a.m. until 3 p.m. on Easter. They will be serving up sushi, raw bar, breakfast items, carving station, entrees, assorted gourmet desserts and more. Adults are $49 a person and children are $20.50 a piece. Sunday Brunch at Harmony Garden Buffet- Harmony Buffet will be serving up a Middle Eastern style, all you can eat buffet from 11 a.m. until 4 p.m. on Easter for only $13.99 a person. Chefs Table Easter Brunch Detroit - Granite City will be serving up an eclectic brunch menu from 8 a.m. until 2 p.m. on Easter. This will include a waffle and omelette station! 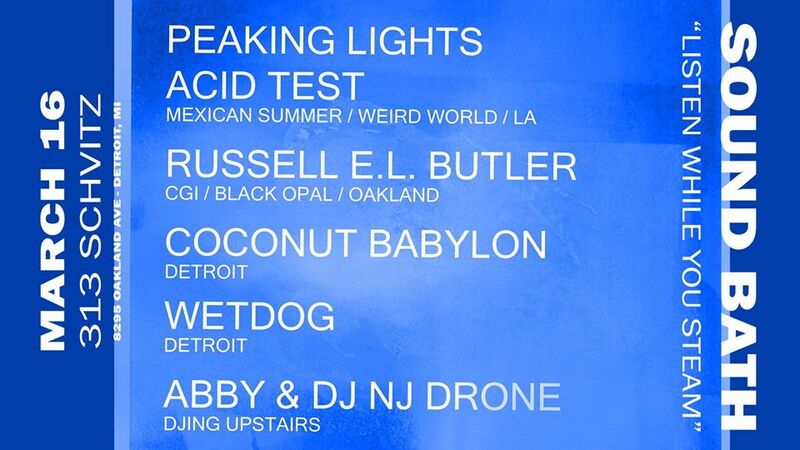 Tomorrow night Lightning Bolt and Wolf Eyes will both be performing at El Club. Both bands are known for their loud and entertaining live shows and El Club is known for its amazing sound system. This will be a match made in heaven for fans of loud in your face entertainment. In fact, don't be surprised if Lighting Bolt forgoes using the stage and gets right down on the floor with their fans, it's their M.O. Tickets to attend this performance are $15 and they can be purchased in advance here. You can also win a pair of tickets to the show by emailing your full name to hipindetroit@gmail.com with the subject line #24. We will draw one lucky person in the morning and they will get to go get their ears blown out at El Club with a friend for free. On February 11th The Huron Room in Southwest Detroit served its last meal and the restaurant closed for three days before reopening on Valentine's Day as Fist of Curry, a low key casual curry restaurant that has a groovy 70's vibe. They ditched their former nautical theme and turned back time to recreate the 70's in honor of the 1973 Bruce Lee film Fist of Fury. The space is red, yellow and orange with brown patterned wallpaper and a beaded curtain when you walk through the door. The restaurant has a very relaxed vibe and a curated menu that features a interesting selection of new interpretations of traditional curry dishes. This includes a wide selection of entrees and appetizers that are vegetarian or vegan or can be made to cater to those diets if need be. They also have an exclusive drink menu that compliments their menu. For our very first visit to the space we decided to try all of their vegan items to see what kind of meal we could get if we went there and only ate plant based. We are pleased to say that this was one of the most interesting meals that we have had since going plant based. It was nice to experience some new and different flavors and to be able to order straight from the menu without making any changes. We started or meal with two vegan appetizers, the curry fried cauliflower and the dragon salad. 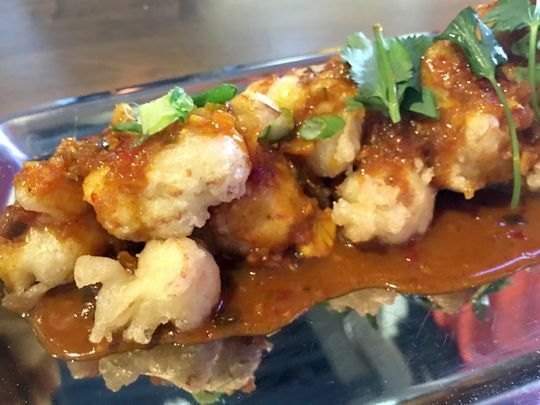 The cauliflower is breaded with rice flour and covered in a spicy glaze with a hint of cilantro. I really loved this dish because the cauliflower kept its crispy texture despite being covered in sauce. We also ordered the Lion Salad as an appetizer. This dish featured an interesting mix of flavors including thai chili, cilantro, peanuts, curry leaves and radish mixed with arugula. This is a very spicy salad with an interesting flavor that we have never experienced before. We also really enjoyed this and would highly recommend trying both of these dishes because they are one of a kind and different from anything we have eaten anywhere else. Finally for our main meal we tried the Smoked Tofu entree. 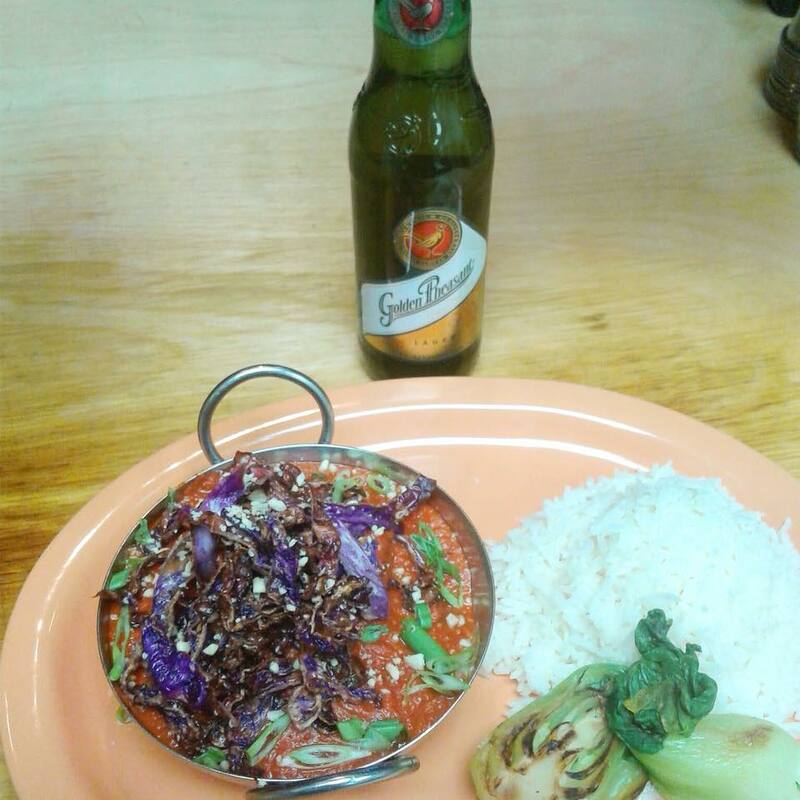 This dish featured red curry, shredded cabbage, scallions and peanuts over Basmati rice. This dish also had an interesting flavor with a tomato base with a very powerful zing. 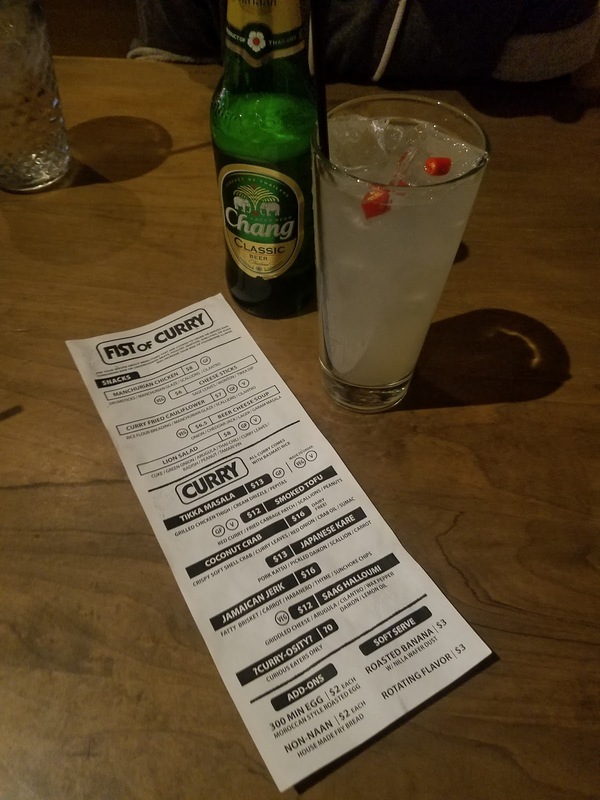 We LOVED this dish and found that the Tom Yom Collins (a very spicy tom Collins) that we ordered was the PERFECT compliment to the entrees flavor. We also want to mention that the portions at this place were plentiful, no small plates or supposedly shareable plates with three bites on the plate. And, all of the food that we ordered including two apps, two drinks and two meals was under $60! We highly suggest making this place a stop the next time your looking for something spicy and original. If you're looking for a great way to relax, look no further than the saunas at Rouge MakeUp & Nail Studio. Their Sauna Lounge is a great place to relax with friends or by yourself. The space is absolutely beautiful and the saunas themselves are sure to make you feel amazing. With temperatures reaching 140° and Chromatherapy lighting, a sauna session is great for the body and mind. 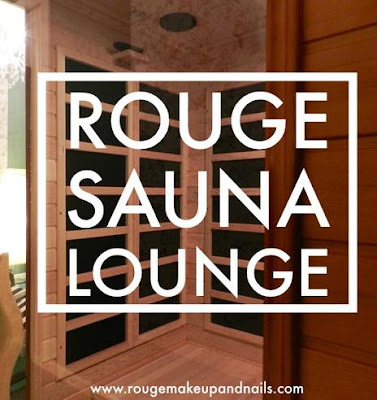 To find out more about the benefits of the Sauna Lounge at Rouge and to book your appointment, head over to RougeMakeUpandNails.com. On March 14th, 2018 students across the Untied States walked out of class for 17 minutes to honor the lives that were lost on February 14th during the mass shooting in Parkland, Florida. The students at Stoneman Douglas High School spoke out about access to guns and called for our leaders to make some common sense gun laws. Some even went to DC to meet with President Trump himself but left feeling that their voices went unheard. But instead of accepting "the way things are" they are trying to make a change by any means necessary, Many students across the US were penalized for walking out making their voices heard on March 14th, but they understood the importance of peaceful non-violent protest, so they exercised their rights as US citizens to make their voices and opinions heard. They are following up the student walkout with a massive march across the Untied States this Saturday, March 24th. The March for Our Lives will take place in over 800 cities across the US, including Detroit and Ann Arbor. 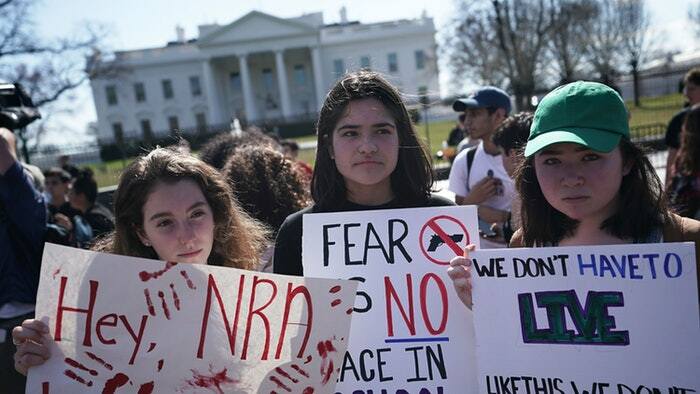 This march is not just for students, but for people of all ages who want to see common sense gun reform. 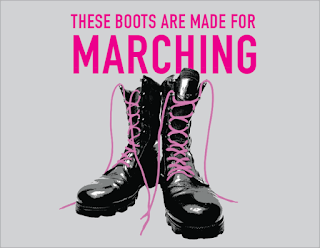 To be part of the Detroit March, meet at 1340 E. Atwater St., Detroit at 11 this Saturday. Everyone in Detroit will be marching to the Renaissance Center where speakers will begin around 12:30 p.m. Speakers include U.S. Senator Debbie Stabenow, State Representative Stephanie Chang, U.S. Congresswoman Brenda Lawrence, as well as students from the Black Youth Project/Movement for Black Lives. To be part of the Ann Arbor March, meet at Pioneer High School at 11 a.m. on Saturday. Everyone in Ann Arbor will be marching through a small area around the meeting point before reconvening for the speeches, which are supposed to begin around 11:30. Speakers include Liana Treviño a Las Vegas mass shooting survivor, and State Representative Yousef Rabhi as well as students from the area. To learn more about March for Our Lives and to donate to the cause click here. Detroit has been through some rough times over the years. Some people blame the car companies or the riots as being the downfall of Detroit, others claim that Detroit's fate was written in the stars. Legend has it that Detroit's founder Antoine de la Mothe Cadillac met with a psychic who warned him to beware of of the Nain Rouge. The Nain Rouge was a little red devil that Cadillac had seen in his dreams, a little red devil that was taunting him. 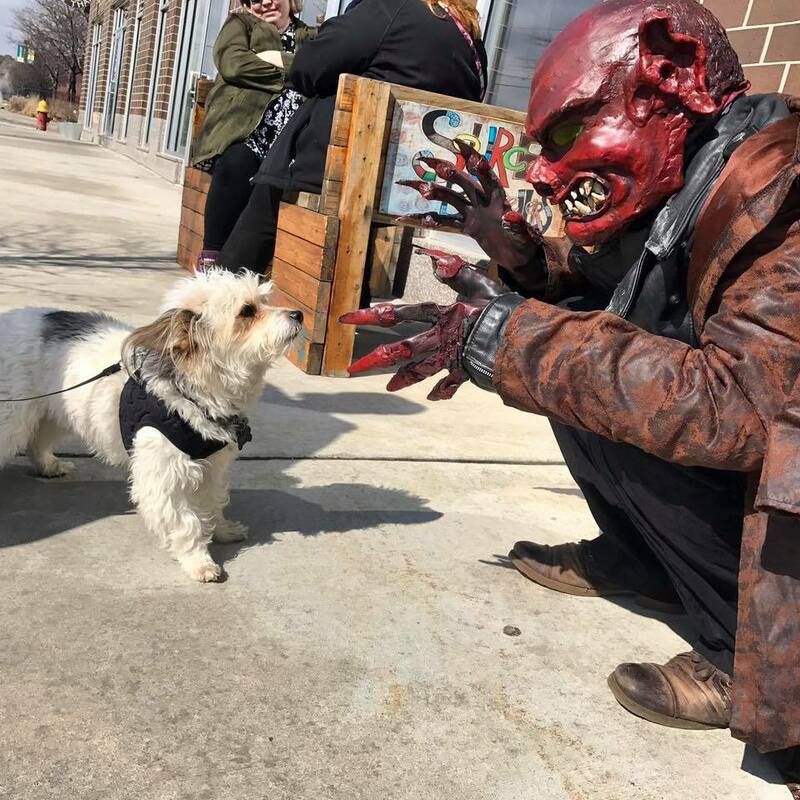 The fortune teller warned him that the little red devil was the messenger of doom, the embodiment of all the anger, pride, and envy that was holding him back. The fortune teller also warned him that if he choose to settle here in Detroit it might pay off one day, but the struggle to get there would be an uphill battle full of set backs. She also warned him to stay away and resist taunting the devil, but he didn't listen. When he met the little red devil, he yelled at him and hit him with a stick, and of course he settled here in Detroit. Let's all join together this Sunday, March 25th and chase the devil right out of town! 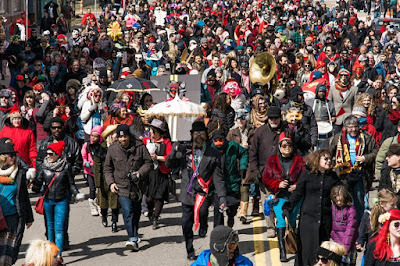 This year everyone will be meeting at the corner of Canfield and Second at noon to match to the Masonic Temple where the Nain Rouge himself will give a speech before we chase him out of town. 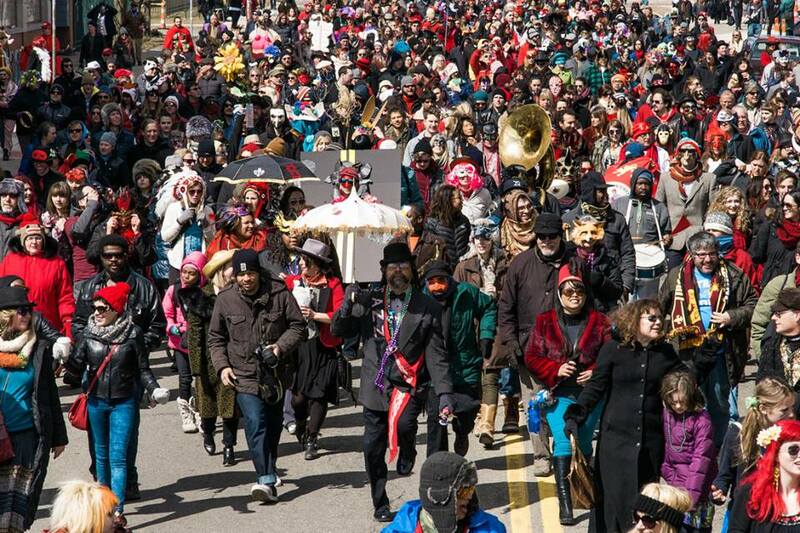 This event is FREE and everyone is encouraged to come out in masks or costumes so that little red devil doesn't see your face and taunt you throughout the next year. Pkew Pkew Pkew is a band that not only has an awesome name, but also plays some awesome music! Based out of Toronto, this band is considered the "Lance Armstrong of music". 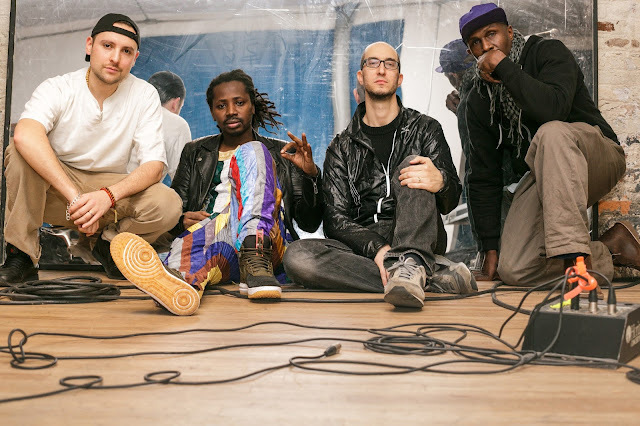 They just played a string of shows at SXSW and they are getting ready to head to Europe for the first time, but first they are making their way to Detroit. Pkew Pkew Pkew is set to hit the stage at Small's this Sunday night. Joining them for the night are The Purps and Bathroom of the Future. Cover to see these 3 great bands live is only $8. You can also save that 8 bux if for a drink or two if you win tickets to the show. Thanks to our friends at Black Iris Booking, we are getting one person into this show with a friend for free. To enter to win, send your name to hipindetroit@gmail.com with #pkew in the subject line. We will draw one lucky winner on Sunday morning and will send them details on how to claim their prize. It's no secret that parenting is hard. If you were ever told that being a parent would be easy, you were misinformed. 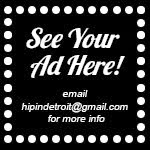 Here at Hip in Detroit, neither of us are parents, but we have mad respect for those with enough guts to do it! Although it's not easy for moms or dads, moms have to go through a bit more when it comes to the whole parenting game, like carrying another human inside them for almost a year, recovering from getting that human out of them, and then after all of that, sometimes they might even decide to use their body to provide food for that little human. The entire process is grueling on the body and the mind. Then, on top of these physical aspects, comes the task of being "mommy". It's a life choice that many women love, but even the mommiest of mommies have to admit that it's hard sometimes! Taking care of another human being and making choices for them day in and day can't be easy, especially since now-a-days there's always a friendly person that is more than happy to tell you how you can do it better. Two awesome women, Shayna Ferm and Tracey Tee, have created a show based on the life of parents, being a mom, and everything that comes along with that. They believe that being a parent is "fucked up" and they want people to laugh about it. The Pump and Dump Show is a "'night out' for parents where every kind of mom can be in the same room – no matter what type of diaper they use or if they ate their own placenta – and together they can laugh their c-section scars open". The show has had audiences laughing across the country and this Saturday night they are bringing that show to the stage at Royal Oak Music Theatre. Tickets to see The Pump and Dump show start at $25 and can be purchased in advance here. You can also enter to win a pair of tickets to the show by emailing your name to hipindetroit@gmail.com with #pump&dump in the subject line. We will draw one lucky winner on Saturday morning and they will get to attend the show with a friend for free that night. To get an idea of what these hilarious ladies will bring to the stage Saturday night and have a good laugh every day, head over and give The Pump and Dump a like on Facebook here. For the first three decades of my life I considered myself a feminist and I spent my time fighting for women's rights. I believed that it was my personal duty to stand up for the powerless and disenfranchised peoples. What I didn't realize was that there was another group of voiceless creatures that needed someone to speak out that I was completely ignoring. In being 100% honest, when I saw that I NEVER even considered the rights of animals. I never thought about their pain or suffering or what raising and consuming animals was doing to our environment. But, once I found out, there was no turning back. As soon as I knew how my actions were negatively effecting others, I knew that I had to change what I was doing. I still think it's funny when I have to tell someone I'm vegan because the idea feels so foreign to me. But, after last weekend I can't imagine living life any other way. Last Sunday I traveled to Ann Arbor with a vegan and cruelty free makeup artist named Jessica Haze to volunteer my time at The Barn Sanctuary. I didn't know what an animal sanctuary was or what a cow looked like up close, but I knew that I wanted to find out. I found out that an animal sanctuary is a facility where animals are brought to live and be protected for the rest of their lives. 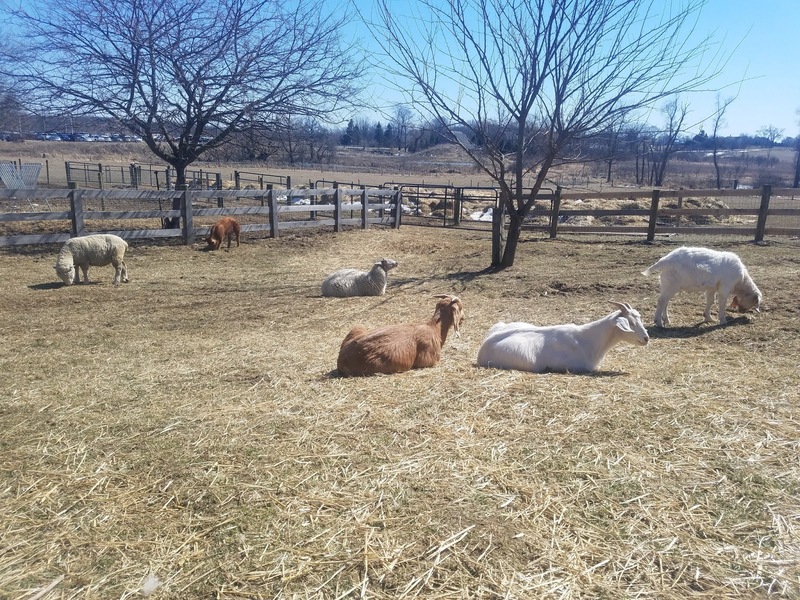 Many of the animals are rescued or have issues that would have sent them straight to slaughter. But instead, they are given a respectful life where they live in harmony with their surroundings and all their needs are met to the best of their caregivers abilities. Unlike zoos or farms, animals that live here are not bought, sold, or traded, nor are they used for animal testing. The Barn Sanctuary in Ann Arbor is a farm rescue sanctuary that is owned and operated by Tom and Dan Mckernam, whose family have owned this farm and this land for a century and a half. 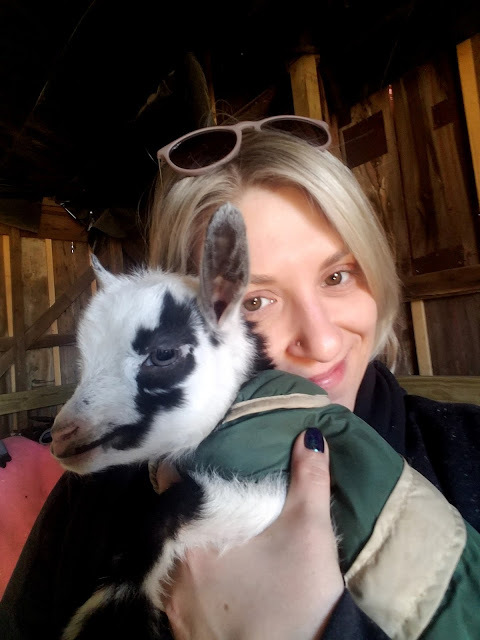 They currently house a variety of animals, including turkeys, chickens, donkeys, cows, goats, pigs, and sheep. Every animal they take in has a name and a home. They are treated with dignity and respect and all their care is overseen by Animal Care Manager Christine Wagner who has helped create and manage a steady group of volunteers that includes Jess Haze and other animal activists in the community. We started our Sunday visit by cleaning out the chicken and turkey coups, helped brush the goats, and even got to spend some quality time in the sun on the 51° day with the new born baby goats, who were wearing little light coats on the perfect day on the farm. The experience of being around the animals was both exhilarating and humbling. 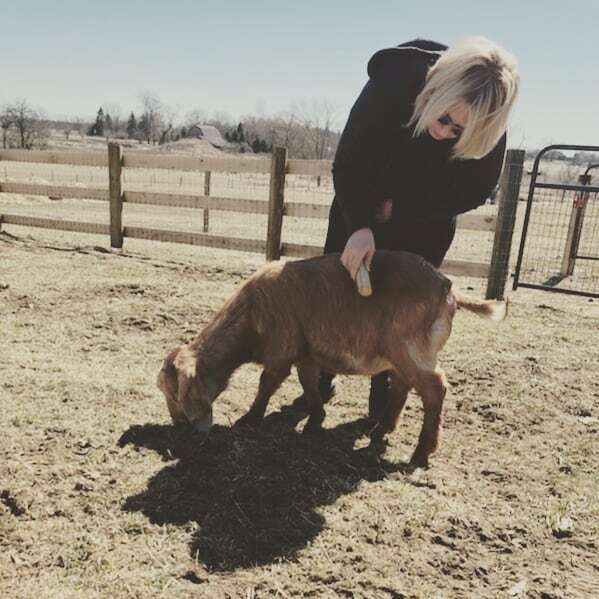 It was really cool to help take care of the animals and it was eye opening to realize that they have friends and families and likes and dislikes and personalities. 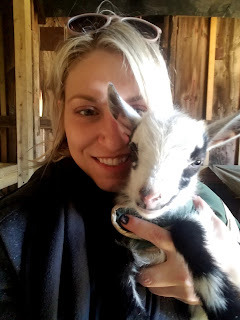 It reaffirmed my decision to live a plant based life and made me realize how much work it is to keep these animals healthy and thriving, especially when so many of them come in with heath concerns from the start. 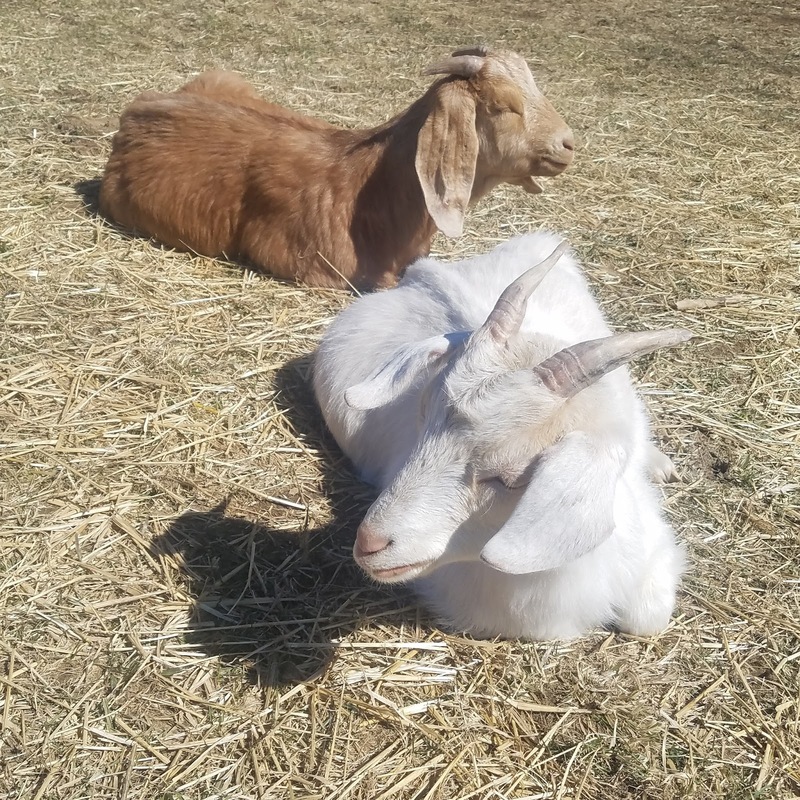 Dan and Tom are in the process of making the sanctuary more animal friendly and are hoping to open the space the public this Spring. Their goal is to have as many people as possible interact with the animals and lean about the benefits of a plant based diet. Once you have seen how happy their animals are and how well they are taken care of, you will fall in love with the Barn Sanctuary. You can follow the stories of all the animals online and make donations to support one or all of the animals. They have one time options and the ability to give something monthly. Plus, they have an Amazon wish list where you can send them gifts to use on the farm. You can also sign up to become one of there volunteers like I did and you might get the chance to get up close and personal with some of the little ladies and gents yourself. But, you might have to shovel some poop and move some things to do so. This isn't volunteer work for the lighthearted though, so if you're going to reach out make sure you're ready to work. The sanctuary gave me a new perspective on animals and reaffirmed my decision to go to a plant based diet. 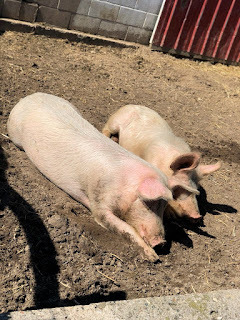 If you would like to learn more about the Barn Sanctuary start following them on Facebook here. You will fall in love with all their furry and feathery friends fast. 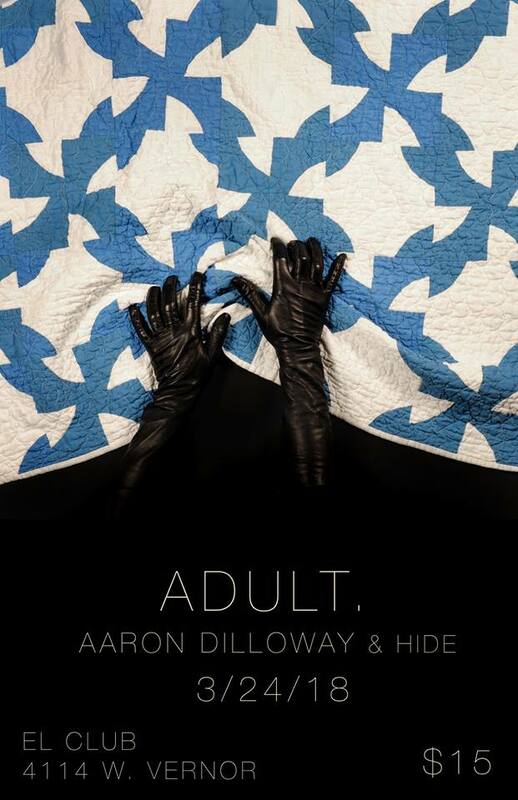 This Saturday night Adult. 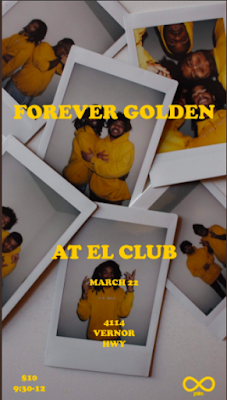 will be performing at El Club. Adult. always puts on an amazing show and we're sure this weekend will be no different! They will be joined by Aaron Dilloway and Hide, making for an awesome lineup. Cover for this show is only $15 and tickets can be purchased in advance here. You can also enter to win a pair of tickets to the show by emailing your name to hipindetroit@gmail.com with #adult in the subject line. We will draw one winner on Saturday morning and will send them details on how to claim their prize. Just a couple of weeks ago, Mo Pop announced its lineup for 2018. One of the most anticipated events in Detroit every year, this festival has brought out huge names like Modest Mouse, Chromeo, Foster the People and Run the Jewels, performing alongside some of Detroit's biggest up and coming acts. Jessica Hernandez & The Deltas, Tunde Olaniran and Stef Chura are just a few of the local acts that have graced the stage at Mo Pop. Well, this year's lineup has been announced and Bon Iver, Portugal. The Man and St. Vincent are just some of the big names on the bill. As far as local acts go, Joe Hertler & The Rainbow Seekers will be performing along with Empty Houses and Curtis Roach. For those that aren't familiar with Curtis Roach, he is a hip-hop artist from right here in Detroit. His latest release Highly Caffeinated was named on the list of Best Hip Hop on Bandcamp. He sites 70's jazz, soul music and late 90's and early 2000's hip-hop as some of his influences. Give him a listen below. Before you check out Curtis Roach at one of the biggest festivals of the year , you have a chance to see him perform live at El Club this Thursday night. 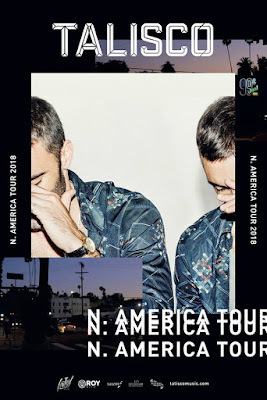 Cover to see him at one of the best venues in Detroit is only $10 and tickets can be purchased in advance here. You can also win a pair of tickets to the show by sending your name to hipindetroit@gmail.com with #roach in the subject line. We will draw one lucky winner on Thursday morning and will send them details on how to claim their prize. Things are set to kick off at 9:30 on Thursday and all ages are welcome. Hip in Detroit Talks All Things Film with M-1 Studios this Sunday! The Hip in Detroit podcast has officially been "on the air" for 18 episodes, none of which would have been possible without our sponsors M-1 Studios. So this month, we are going to take it back to the basics and talk to the guys and gals who helped us bring all things hip to the podcast waves. M-1 Studios co-owners Mike and Peach and a couple producers from their staff named Chelsey Knapp and Mandy Looney will be visiting us in studio to chat about all things film. M-1 Studios built their company by creating quality content and helping to document big local events like Arts, Beats & Eats and Winterblast, but they also know a lot about the Detroit underground film culture. They have participated in events like the 48 hour film project and regularly attend Sundance. Basically, they have a lot of stories about movies and films in and around the City of Detroit and we want to get their perspective on their under talked about aspect of the city's arts and culture. You can tune in live to hear us chat with the men who helped us start it all this Sunday at 6 p.m. live on PodcastDetroit.com. The show will stream live on the air and then will be posted to listen to list to whenever you would like. We never know what studio we will be in until we get there, but we also post it on our Instagram story as soon as we find out. So make sure that you are following us so you know where to fin us on Sunday! If you would like to check out some of our past interviews, you can click here. We have talked to all sorts of hip people, including Jax Anderson from Flint Eastwood, some of Detroit's best booking agents like Virginia Benson, Ramona Roa and Nate Dorough. We even chatted with Camera Jesus and Chad from Wilson on the same episode! 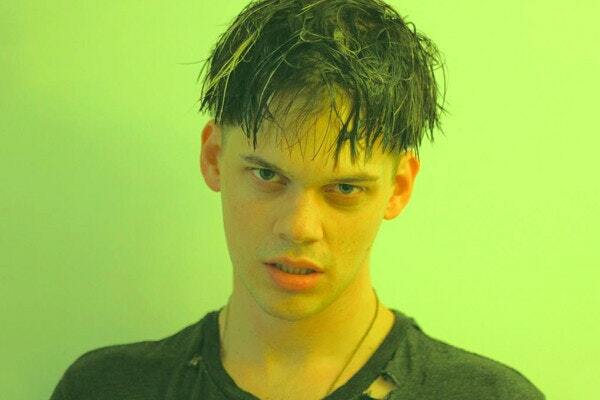 Just over a week ago George Clanton released a new single called "Make it Forever" and tomorrow he will kick off his next tour right here in Detroit. Clanton is taking his music past vaporware and into a whole new realm. 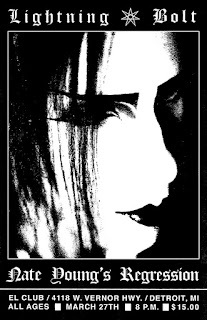 He wants to share a intimate night with you and show you what he thinks is the feature of music. He has invited his friend Negative Gemini to open the show and all ages are welcome to come out to hear the future. Tickets to attend the show are $10 in advance and $12 at the door. We also have one pair of tickets to give away to the show courtesy of Party Store Productions. If you would like to enter to win them please email your full name to hipindetroit@gmail.com with the subject line #newnew. We will draw one lucky person tomorrow morning and email them details on how to claim the prize. At Hip in Detroit, we're always talking about how there are so many shows every night in Detroit that sometimes it's hard to decide which to go to. There are a ton of great venues and bars throughout the city, hosting local and national acts every night of the week. Well, back in the late 1970's, that wasn't the case. In the late '70s, there was Bookie's (a.k.a. Bookie's Club 870), and that was pretty much it as far as rock clubs went. 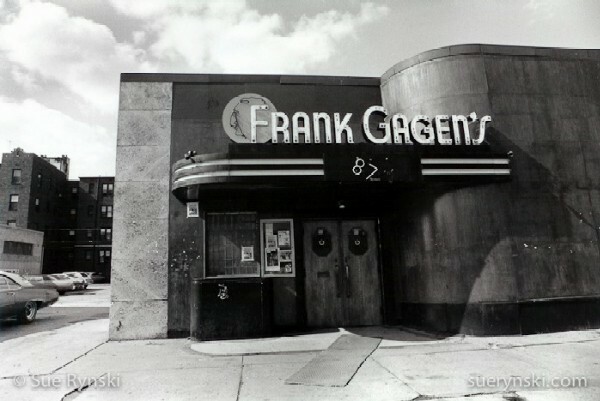 The bar opened up in 1978, when the band The Sillies first started booking shows at Frank Gagen’s at 870 McNichols. The shows they booked did so well that it eventually took over Frank's, and the bar transformed into a punk club. 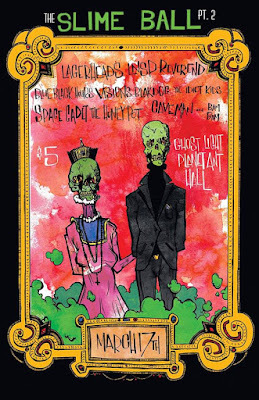 Bands like The Misfits, Joan Jett & The Blackhearts, The Police, and The Cramps all played Bookie's, with Detroit bands like The Romantics, The Mutants and The Sillies playing there on a regular basis. Even many celebrities made stops at Bookie's while they were in Detroit, just to check out this club that everyone was talking about. The venue only lasted a few years, changing owners and format in 1982, but in those few years it became legendary and Bookie's is a name that most Detroiters know. 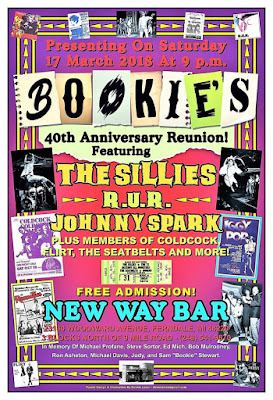 This Saturday night you have a chance to relive the awesomeness that was Bookie's by celebrating the bar and venues 40th anniversary! 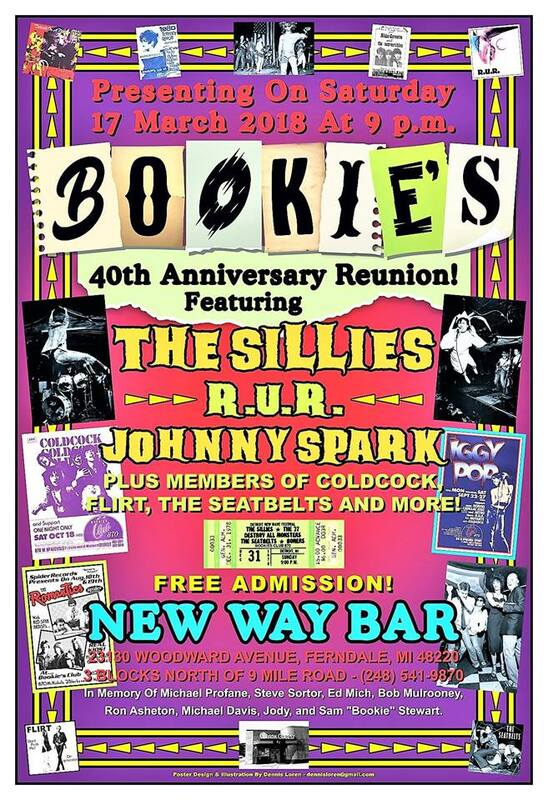 Bookie's is having an anniversary and reunion show at New Way Bar in Ferndale, featuring music from the band that started it all, The Sillies. Coldcock, R.U.R., and other surprise guests will also perform throughout the evening. Plus, there will be flyers and photos on display too, so you can either reminisce or experience Bookie's for the first time. Things are set to kick off at 9 p.m. and cover is free for this event. For more info, click here. Michigander Releases his first EP "Midland" Today! Some people think that Michigander is the word to describe a person that was born in Michigan and history buffs will tell you that its actually an insult word created by Abraham Lincoln during the election of 1860 to insult his Michigan born opponent by comparing him to a goose (shout out to Travis Wright for teaching us that one on our podcast). But, if your hip to up and coming music here in Detroit, you know that Michigander is a talented young up and coming Detroit artist. The multi talented artist has already has recorded sessions with Audiotree, Daytrotter, and Sofar and is celebrating the release of his EP Midland today. You can check it out and listen to it in full here. It is the first EP that he has ever released and he will be celebrating with a formal release party at the Magic Stick in a few weeks. But before the big party, we reached out to ask him a little bit about his new EP and what he plans to do this summer. Take a second and get hip to Michigander and then mark your calenders for the EP release party on March 24th, also featuring another great up and coming act called Brother Son! HID- Why did you choose the Magic Stick for your album release party? Michigander- "I’ve wanted to play the stick ever since I was about 13 years old. My friends and I used to watch this old VHS tape of the White Stripes playing there. It was one of my early exposures to rock and roll in general." HID- Is there a special meaning behind the EP title "Midland"? If so can you share? Michigander- "Yeah, Midland is the name of the town I grew up in and currently live in. It’s about two hours north of Detroit, up 75. It’s a very typical small Midwestern town. Lots of chain restaurants. But, I think recently I realized it’s not about where you are, but who you’re with and I'm with a lot of great people up there." 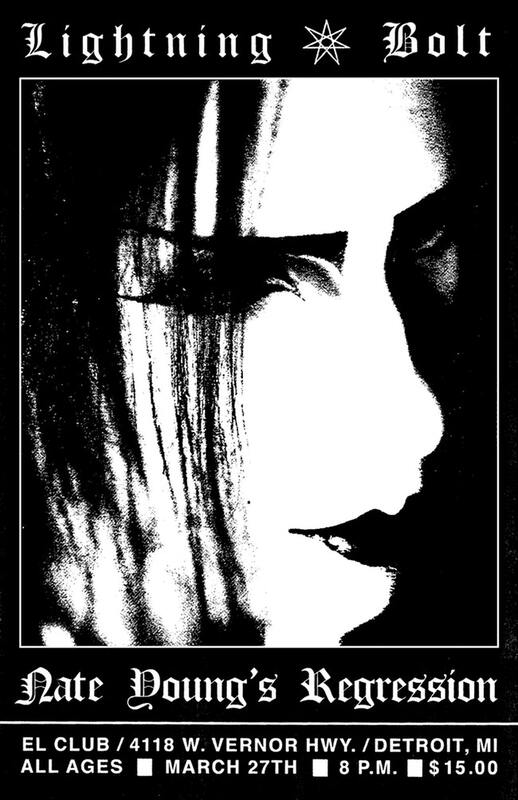 HID- Sometimes your voice makes me tear up, have you ever looked out and seen someone tearing up at one of your shows? Michigander- "I’ve never seen anyone crying. I have heard sniffles once or twice. I have seen people making out during the songs. Not sure if that counts for anything." HID- Why did you decide to put out a physical copy of the EP? HID- What song off your current set list are you the most excited to perform in front of everyone on the 24th? Michigander- "I’ve been working out the set list for the show and trying to figure out the best order of things. I think playing East Chicago, which is the last track will be my favorite. It’s my most favorite song that I’ve ever written and I can’t wait for people to hear it." HID- What do you have planned for this summer? Michigander- "We are playing a few fests around the Midwest and working out some other things. It’ll be hard to top last summer." Michigander- "There is a band called Lo Moon from LA. I have not stopped listening to their record. 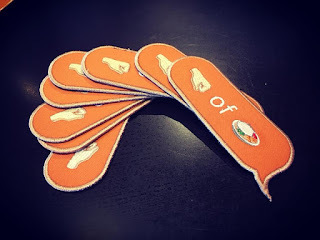 I hope everyone checks them out." HID- Will there be any surprises on the 24th? Michigander- "There will be a lot of friends joining me on stage. Especially the last chunk of the set. I wanted to do confetti. But I don’t think that's gonna happen. All in all it will be a very special evening." Michigander- "Mi Pueblo has the best tacos in Detroit. *drops mic*"
Michigander will be performing live at The Magic Stick on March 24th. You can get advanced tickets to attend the show here. We are looking forward to this one! This Saturday night a ton of great bands will come together for The Slime Ball Part 2. That doesn't mean they are coming together to help out some creepy dude, a.k.a. a slime ball. They're coming together for an awesome one day fest called The Slime Ball. 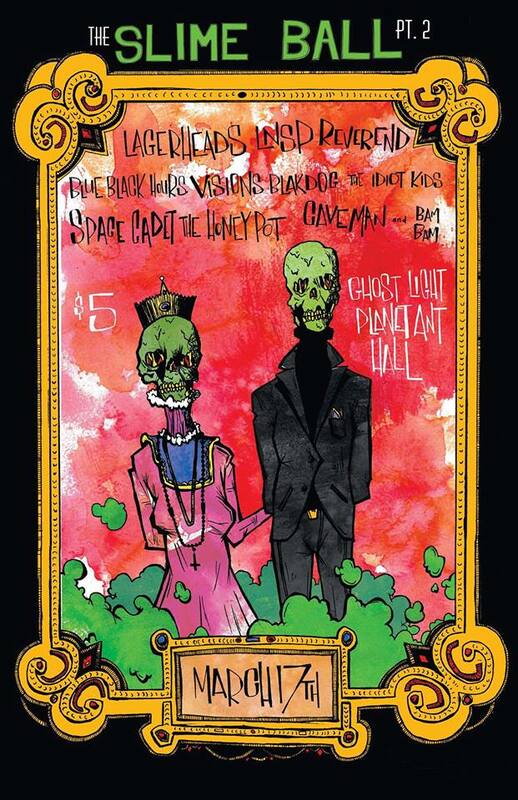 The event is taking place at Ant Hall and Ghost Light and will feature 10 bands on 2 stages for just $5. Plus, proceeds from this event will help put on another awesome show, Whatever Fest, taking place in May at the Tangent Gallery. Spacecadet, The Honey Pot, Lagerheads, Caveman & Bam Bam Detroit, Reverend, LNSP, Visions, BLAKDOG, The Idiot Kids and Blue Black Hours. Doors to the bar open at 7 and LNSP will kick things off on the Ant Hall stage at 9 p.m. Make sure you get there early to catch them, we guarantee you will like what you hear! To see a full list of set times and which band is playing on which stage, click here. If you would like to attend The Slime Ball for free and save that $5 to buy a corsage for your date, you can enter to win a pair of tickets to the show by emailing your name to hipindetroit@gmail.com with #slimy in the subject line. We will draw two lucky winners on Saturday morning and they will each get into the ball with a friend for free. This is guaranteed to be a fun time, so don't miss out! For more info on The Slime Ball Pt. 2 and to hear music from some of the bands, click here.